To get started with Timbeter, the only step a user needs to take is to download Timbeter’s app on Google Play or App Store. This is one of the very few moments in which the web connection is necessary, which means that, in addition to being fast, practical and digital, Timbeter can also be used in any environment and locality, without relying on the use of mobile data or wi-fi. Timbeter operates offline to perform all measurement functions – diameter, pile, density or truck measurement. In a simplified way, this is possible because our detection algorithm is embedded at the time of downloading the app. 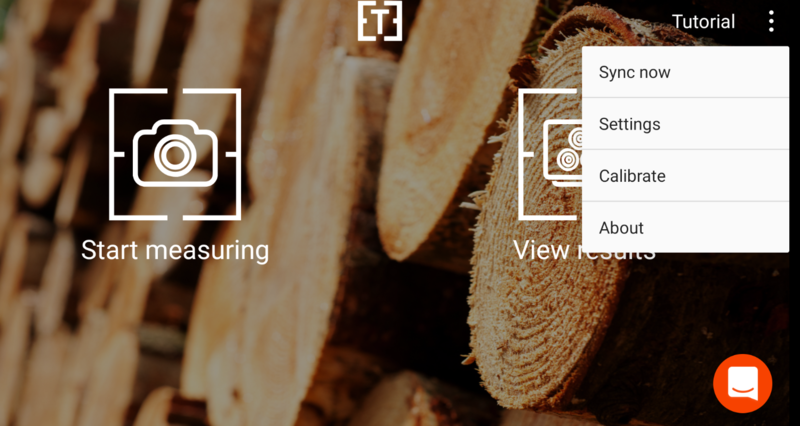 Offline operation is essential for anyone who needs to measure wood logs in a location with faulty internet network or even with no connection at all. In order for the application data to be sent to the storage module, there must be an internet connection when the application is synchronized with the database. Make sure you’re connected, and on Timbeter’s home screen in the upper right corner, click “Sync now”. The data will then be sent to the cloud for reporting, organizing inventories and for an overview of the images that were made and the measurements taken. Synchronization is also important if any changes were made to the storage module – new species of trees, new assortments, qualities and culls. When a user adds new data to the storage module, it is necessary to connect to the internet with the application and synchronize it so that these changes are available and can begin to be used as soon as possible. Our team is constantly working to improve the detection process and implement novelties and new functionalities for users. Solution updates on the Android system automatically occur with each new release, and so the user is sure to have an updated version is very simple: on the home screen, just click “About” on the upper left corner and check the ID of the version. If you have any questions, you can update your app on Google Play and also check its latest version. In our last update, we included the possibility of uploading the measurements and also the synchronization only by wi-fi, thinking especially the users who need to pay small fortunes for the use of 4G mobile data. With this update, it is possible for the user to click only on the type of connection which would like to upload the measurements. We hope you enjoyed knowing about our internet management with Timbeter. Do you have any questions or suggestions? Our team will be happy to be in touch!